Arnaud Maggs, a Toronto artist, began his portraits of the human head six years ago. 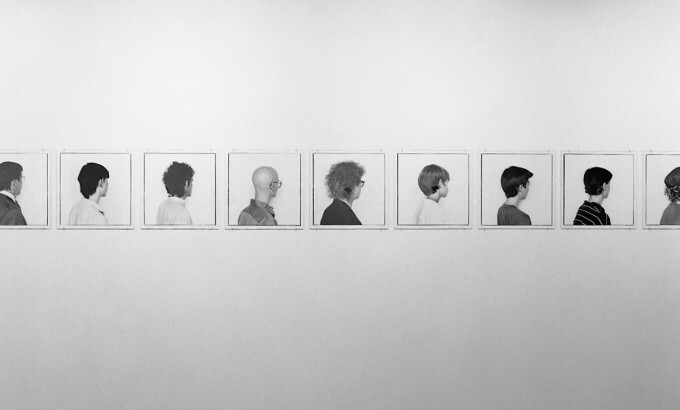 In 1978, 64 Portrait Studies was exhibited at the David Mirvish Gallery. The following year his portraits of French chef Ledoyen Series, was exhibited at YYZ Gallery in Toronto. Last winter Maggs had a one-man show at the Canadian Cultural Centre in Paris. He also completed another series of photographs taken at the unstakable Dusseldorf. This recent work was included in the exhibition Realism: Structure and Illusion at the MacDonald Stewart Art Centre in Guelph earlier this year. In Downwind,the work that will be shown at Mercer Union, Maggs has departed from the frontal and profile format usually associated with his work, and examines the head form a new and unconventional point of view. Arnaud Maggs’s evolution as a photographer has been a long and deliberate process, though he has only been taking and showing gallery photographs for six or seven years. Now in his 50s, Maggs has worked as an advertising director, a commercial artist, and a commercial photographer, all of which seems to have moved him closer and closer to the work he now makes. 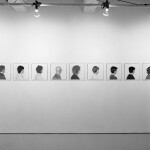 His first major show, exhibited at the David Mirvish Gallery in Toronto in 1978, was called “64 Portraits.Its title is misleading, for though the central image in each photograph is the head of a human being, portraiture is certainly not the perceived intent. Perhaps the individuals photographed were subject to the camera gaze, but they are not the subject of the work. However, by taking as its subject a set of human features, each photograph points boldly to this split between the camera’s subject and the subject of the final, multiple-image piece. It is a split which is reiterated in the presentation of the portraits as diptychs. 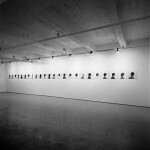 There is one frontal shot and one profile of each of the 32 faces in the exhibition. In every pair, each photograph seems completely irreconcilable with its mate, yet they are of the same person. 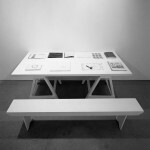 The construction of the piece on both a horizontal and a vertical axis (the pairs are linked vertically in a grid of four rows of 16 photographs each) emphasizes the quality of scientific investigation, while making evident the fundamental divergence between whole and parts. The piece is as much an installation as an exhibition of photographs. It is about textuality and contingency – a kind of photographic braille created out of proximity and context. Each portrait seems chosen for the absence of expression, as if to compare features and to identify individual differences within a format of constant postures. Within the logarithm of Maggs’s presentation, the faces seem to multiply and illuminate each other. Perhaps in its obsessiveness, Maggs’s work has some of the serial qualities of the work done by the Bechers, but theirs is a project which cannot escape its subject. Being mainly industrial, the Bechers’s buildings are intimately connected with the specific cultural evidence of economic structure. The subject/object dilemma of photography is unabashedly acknowledged in Maggs’s work with the presence of some thing as ostensibly subjective as a face. But however emotionally charged it may be, the face of a human being, without adornment and without surrounding evidence of “character,” is something devoid of cultural signification. Maggs’s choice of faces tells us about his milieu and, perhaps, about his preferences in facial features, but it tells us nothing about the lives of the individuals portrayed. Side by side, Maggs’s pictures unwittingly carry out August Sander’s real intent, and in so doing inadvertently remove themselves from the level of document and become about photography. In the more recent Serie Ledoyen, portraits of French cooks, Maggs succumbed to the fluidity of sequence which was implicit in the presentation of 64 Portraits. Three frontal and three profile shots of each cook were presented as two pairs of three, side by side, in a contact sheet format. 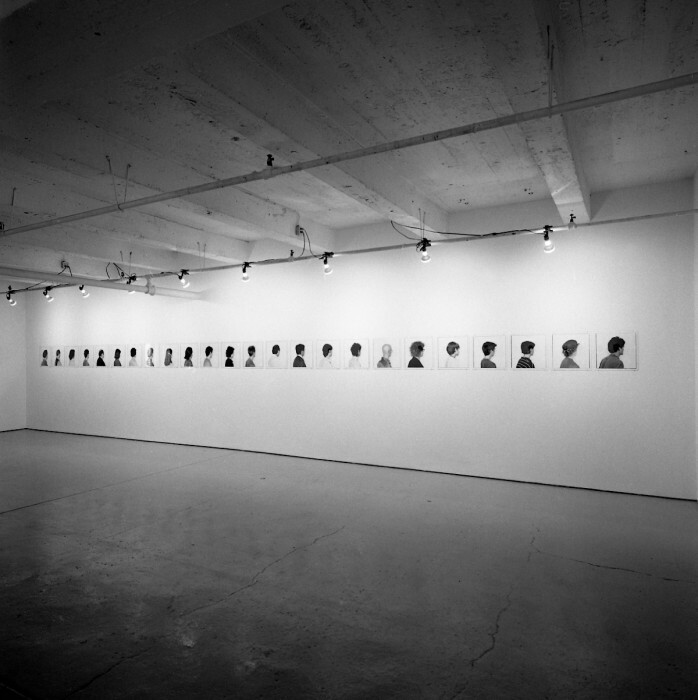 The vertical/horizontal axes of 64 Portraits emerges as a tactic. In this piece, the constant becomes the individual face, the variable is the expression – exactly the opposite of 64 Portraits. As opposed to the careful editing executed for 64 Portraits, Serie Ledoyen is immediately answerable to the moment of taking each photograph, and to the photographing session itself; it is infinitely grounded in the moments between each shot, in clothing, and in expression. The photographs become a filmic event, a deconstructed flip book, Muybridge-like in their apparent sequence. Serie Ledoyen was almost accidental in its construction – the cooks, of course, were dressed for work and pressed for time – a factor which changed the work considerably. Maggs’s new work, of which Downwind Photographs is an excerpt, is less edited. It describes the event of an individual portrait sitting; most pieces use only one person. There are a number of pieces in which the subject was asked to turn slowly by degrees, and a shot was taken at each hour of the clock, so to speak. When printed as contacts, the illusion of facial animation and the actual movement of the body between frames is multiplied by the sequential/textual axis. The printed contacts seem, in their apparent activity, literally to buckle the paper on which they are printed. This kind of strict conceptualism is not all that interests Maggs. Downwind plays implicitly on the power of the juxtaposition of individual frames to indicate the potential syntactic autonomy of each. 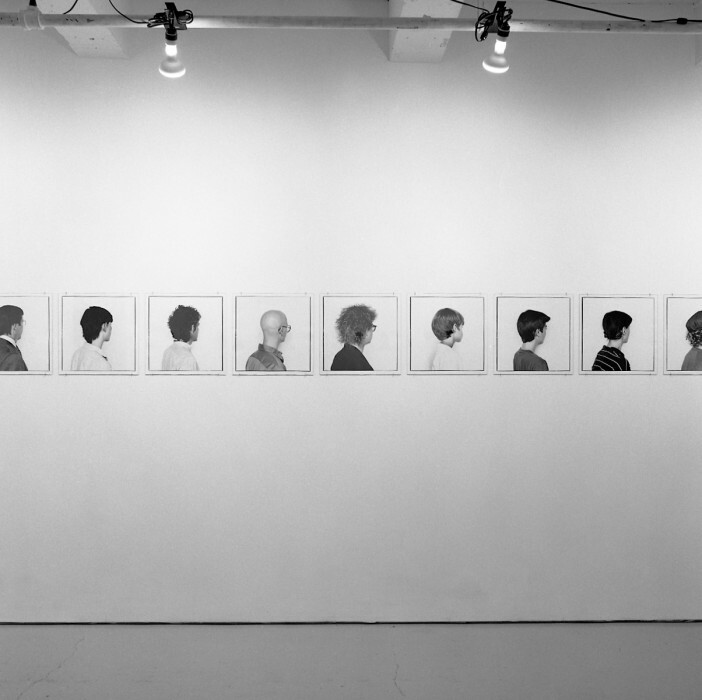 As if to see if they stand on their feet, Maggs has taken a number of three-quarter profile shots of different people from the larger series and presented them together. Two opposing walls of the Mercer Union gallery were each hung with a long row of these shots. Just below eye level, each photograph implies the sequential precedents and antecedents which should be extended above and below them. Downwind makes careful reference to a body of work the magnitude and precision of which places it on the border of research. Pointing back to the kinds of textually edited concerns of 64 Portraits, the two rows of people looking downwind indicate the missing sequence of their individual sittings in which they appear to be winding down the contact sheet page. Suddenly shying from the approach to notions of individuality and gesture which show up in the individual sittings, Maggs turns again to the comparative anonymity of association. The line of cheekbone and jaw, pointing to and hiding nose and mouth, have the oddly clinical feel of early phrenological studies. The ear, pointing directly at the camera – as the eye should be – is displaced and amplified in significance. As if forming the back line of a crowd you can’t get through, all seem to be looking downwind through holes in the wall, their gaze as directed and constant as that of the photographer who placed them there.